The bottom line is that we believe the Bible to be God’s Word to us, and if God says it, we’ll do it! Religion and traditions of men have clouded or denied the truth of the Word of God, rightly divided. If the Word of God and our traditions or what we have been previously taught disagree, we choose to side with God’s Word. The Bible declares that without faith, it is impossible to please God. Upon further study, it is very plain that without faith, you cannot be born again, be healed, live in victory, or even get your prayers answered. While some take faith to an extreme and become presumptuous or even foolish, others go to the other extreme and avoid the principles of faith altogether. Both miss out on the beautiful fullness of life that God intends for us to live in. At Jacksonville Word of Faith Church, we believe and teach the whole counsel of the Word of God, rightly divided. Once you begin to see the truth of what God wants for you in the word, your life will take on a whole new dimension. The way to enter into this victorious life is by faith, learning the simple, yet powerful principles of faith and applying them to every area of your life. Galatians 5:6 states that faith works through love. That is to say, that unless we love others, our faith will not work. It is the love and goodness of God that draws people to God. God’s love and goodness must be evident in our lives if we are truly His followers. It is our prayer that anyone, regardless of their race, financial standing, background or status in life, will see and know the love of God towards them through us. God is seeking those who will worship Him in spirit and in truth. At Jacksonville Word of Faith Church, we believe in lively, Spirit-filled praise and beautiful reverent worship as found in the scriptures; yet all the while doing everything decently and in order. The scriptures are clear, and it is evident in our walk through life that we are in a spiritual battle. We know that our battle is not against people, but rather against the forces of evil. God has equipped us with mighty spiritual weapons and has given us the authority to war against and realize victory over the devil and his demon forces. But we cannot remain inactive in battle. Instead we must not only know but use our weapons and not be ignorant of the devil’s devices so we can demonstrate his defeat. Thanks be to God who always causes us to triumph in Christ Jesus our Lord! 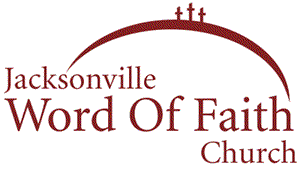 Jacksonville Word of Faith Church is a member of the Association of Faith Churches and Ministers, founded by Jim & Kathleen Kaseman.